Dunn secured four distinctions in English B, English A, Office Administration and Food and Nutrition. She received a grade one in Social Studies, a grade two in Information Technology and grade threes in Geography, Biology and Mathematics. She is the daughter of Dave and Hazel Dunn of Ratho Mill. Nedd, a resident of South Rivers and the daughter of Roland Nedd and Ancell Chewitt gained four grade ones in Principles of Accounts, Social Studies, English B, Integrated Science and a grade one with a distinction in English A. She gained grade twoâs in Office Administration, Mathematics and Information Technology. âI wasnât really expecting what I got. But thank God that I did well. I really put my best foot forward and I guess it really paid off a lot,â a smiling Nedd told SEARCHLIGHT. Her parents, she said were also happy about her success, adding that her father could not sleep the night she received the good news, as he was so happy. Her mother, Nedd related, was also overjoyed. Dunn, though surprised at her good results said that with more studying, she could have done much better. She related her disappointment in her Information Technology scores as well as her grade for Mathematics. âI was expecting a one for math; I was surprised that I got a two,â she said. The girls both said that the first exam they sat made them very nervous, but as time progressed, being in the exam room felt quite natural. 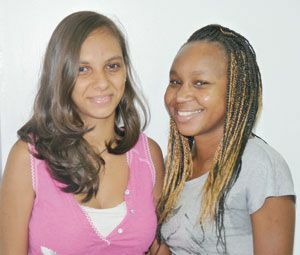 They both did a lot of studying, following study timetables and doing past CSEC examination papers to prepare for their examinations. Nedd added that she was also encouraged by her aunt, who she said thought that she would have got more grade ones. Nedd, who loves listening to music, singing and reading, plans to become a teacher as she has always been attracted to the profession. âEver since I was a little girl I would be teaching my cousins at school, at pre-school right up to secondary school,â Nedd said. Dunn on the other hand, who enjoys playing with animals and photography, has not decided on a career, but intends to attend the St. Vincent and the Grenadines Community College Division of Art Sciences and General Studies. Meanwhile, Nedd is still deciding which to attend first, the Division of Teaching or the Division of Art Science and General Studies. Expressing thanks to God, friends and family, Nedd also expressed how proud she was of her fellow classmates. âI must say Iâm, very proud of them, they really surprised meâ¦most of them got all them got all their subjects and I must say Iâm very proud of them,â she said. Dunn also expressing gratitude to God, her family, friends and teachers also gave advice to upcoming CSEC candidates. âHard work pays off,â she said.